There are some foods that I haven’t eaten in years, but every time I revisit them they totally bring me back to memories of when I was younger. Hot Cross Buns are one of them. 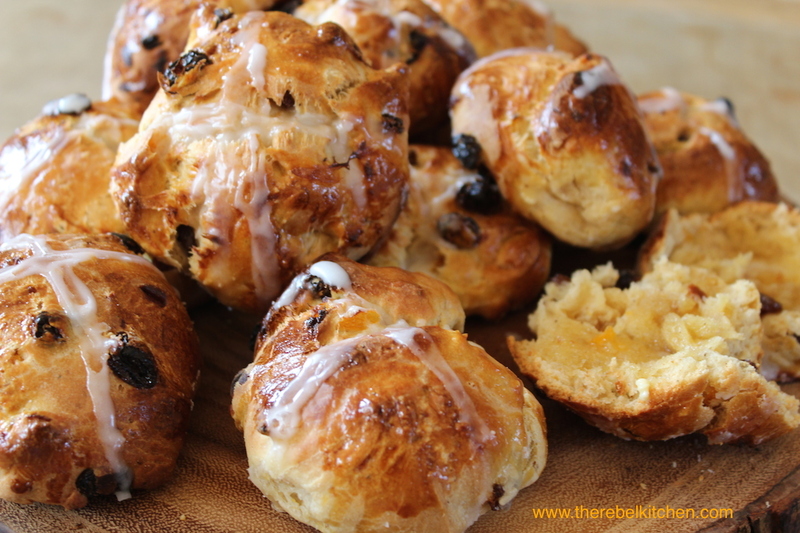 Around Easter time every year, I would come home from school and find my Mum had bought a few hot cross buns which we would toast and slather in butter and jam. 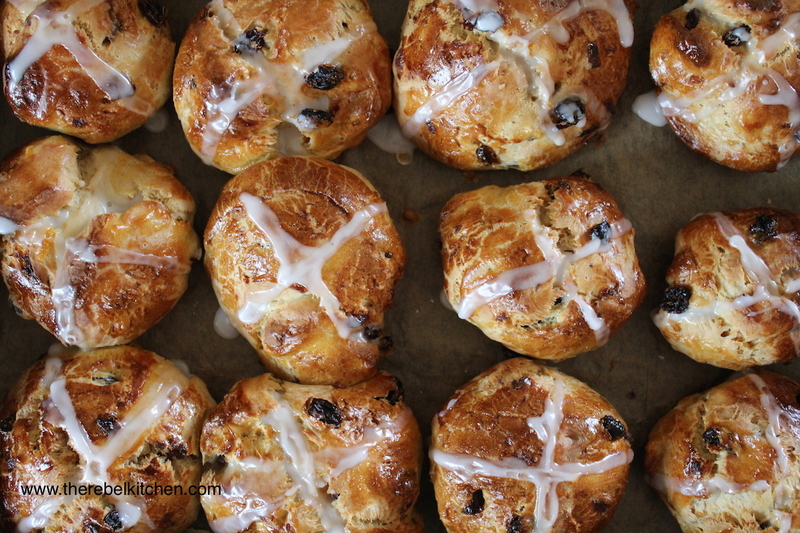 Those spicy hot cross buns were so comforting and such a nice treat to come home to. While experimenting (and failing) with a few breads last night, I decided to give some hot cross buns a go and thankfully they turned out perfectly! 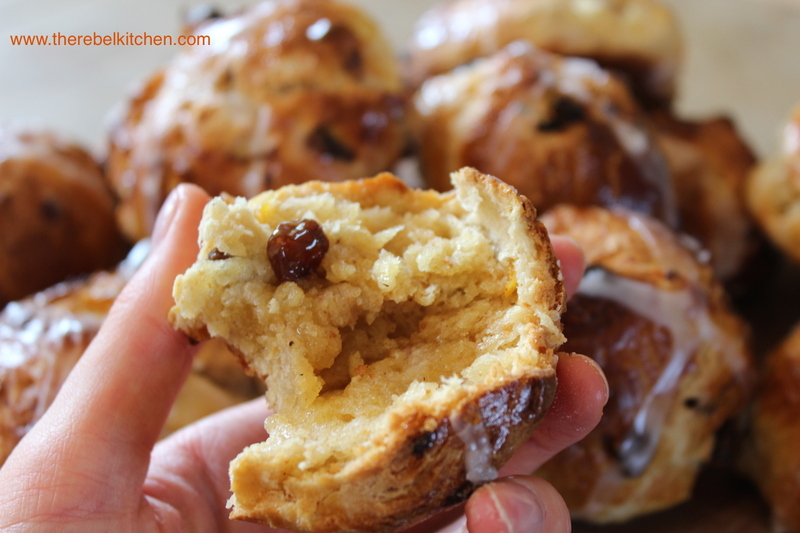 These are actually quite easy to make, but as they use yeast you do have to wait for them to prove twice. Still that’s no big deal if you’re at home for the evening. They made the perfect late night snack. For the crosses just mix some white flour and water and roll out into a spaghetti size piece and press into the buns. The more flour you use though, they harder your crosses will be, so try keep them as liquid as possible to avoid your teeth breaking off when you bite into them. (Note- this particular time I used more of a paste and the crosses pretty much disappeared while baking so I outlined them in icing sugar once baked… So make sure to make the spaghetti style pieces for the crosses!) 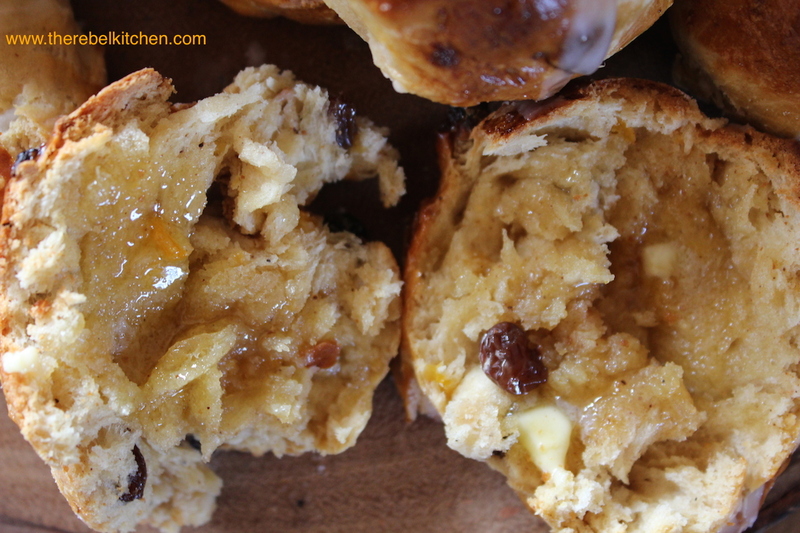 For the sticky glaze on top of the Hot Cross Buns, I used some Llewellyn’s Irish Apple Syrup which was delicious. I picked up a bottle in the Dun Laoighre market at the weekend, and their stuff was amazing. However you could use honey, maple syrup, melted marmelade etc. I hope you enjoy these buns, and they take you back through memory lane as well. 1. 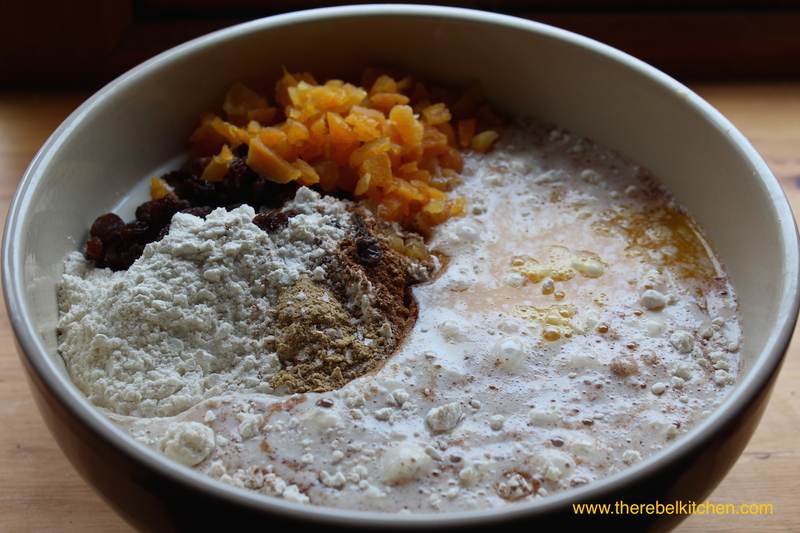 Mix together the flour, salt, spices, brown sugar, spices, raisins and orange zest in a bowl. 2. Add a teaspoon of sugar to the warm milk and add the dried yeast, stir together and leave sit for five minutes. Add the yeast milk mixture, the melted butter and one of the beaten eggs to the flour mix, and mix together until it forms a dough. 3. 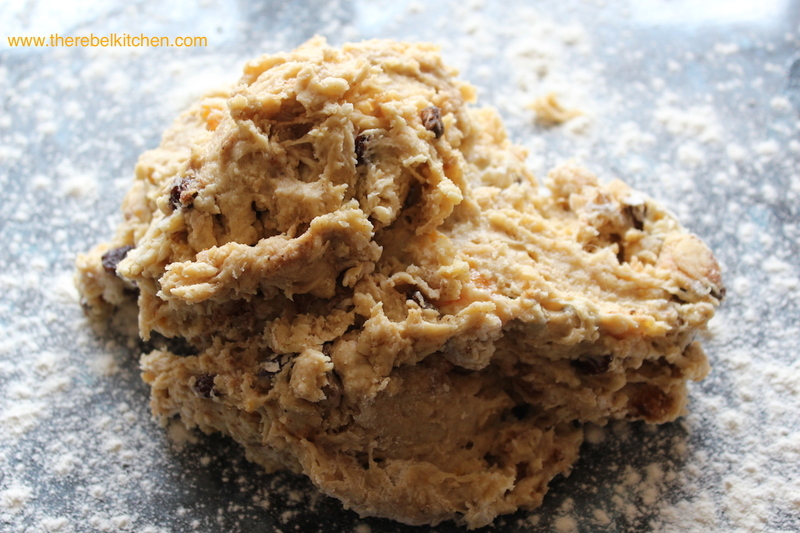 Place the dough out on a floured surface and knead lightly for about 10 minutes. Then cover lightly with sunflower oil, place in a bowl and cover in cling film. Leave it for an hour to prove and it should almost double in size. 4. 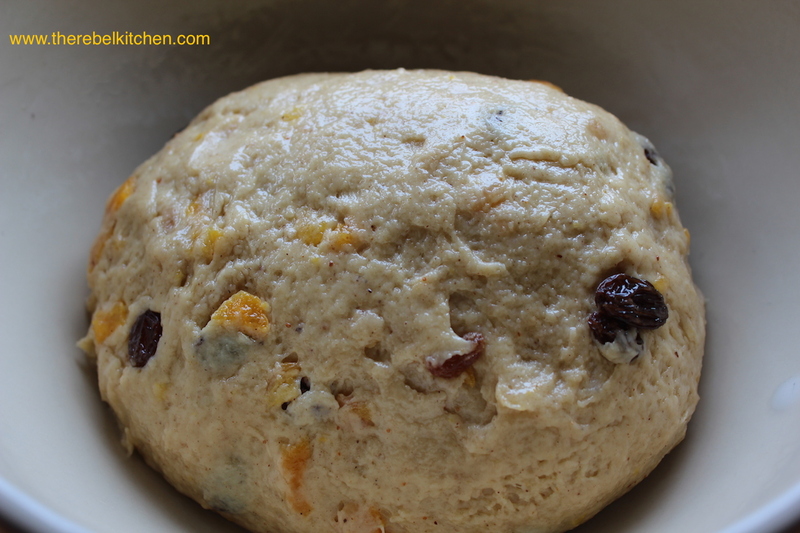 Knock back the dough (very lightly knead again for a minute) and portion into 10 to 12 pieces. Mix together some white flour and water and form little spaghetti like pieces of dough and squish into the buns in a cross shape. Brush the buns with the remaining beaten egg and leave in a warm place to prove again for about 30 minutes. 5. Pop into an over heated to about 200C for 15 to 20 minutes. When they’re done take them out and brush lightly with your apple syrup (or other chosen sticky stuff). Enjoy hot with plenty of butter and jam! They’re great the next day toasted too.. 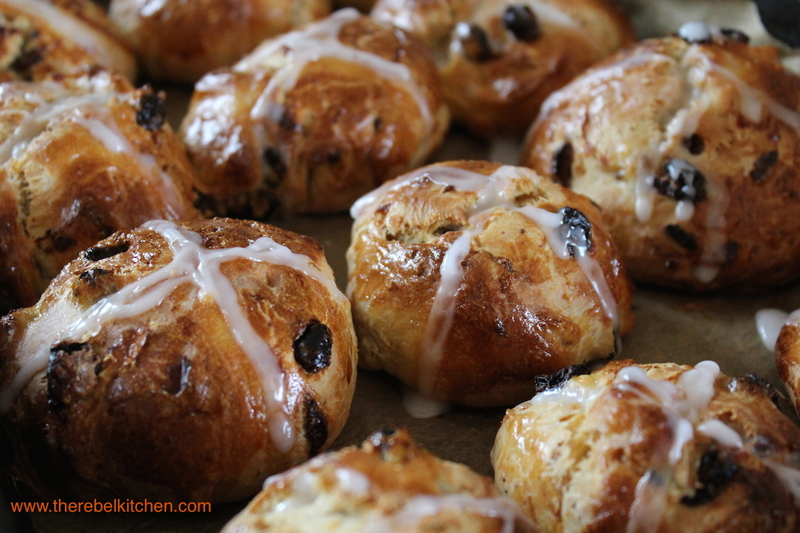 Hot Cross Buns must be served hot after all!